What is a Supply Curve? 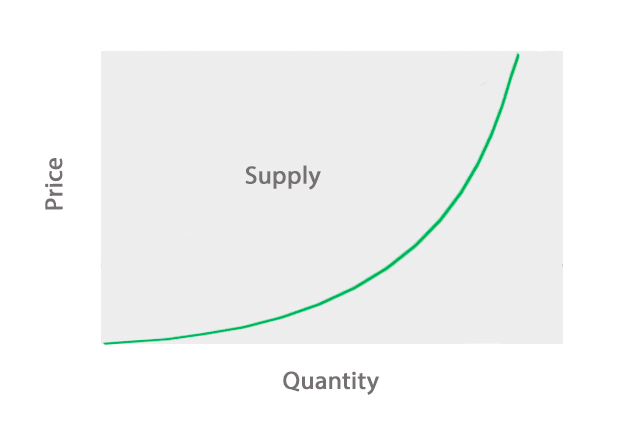 Home » Accounting Dictionary » What is a Supply Curve? Definition: The Supply curve is a graphical representation of the quantity of a product that a supplier is willing to offer at any given price. The price of the product is measured on the vertical axis and the quantity of the product is measured on the horizontal axis. What Does Supply Curve Mean? The quantity supplied is mainly related to the price of the product, but there are also other factors that can influence how much quantity a seller can supply at a given point in time. Such factors are the production technology, the price of substitute products, the existence of other factors of production, and the cost of labor. However, in the basic economic analysis, we investigate the quantity supplied with respect to the price of a product, assuming that all other factors that could influence the price remain constant. The price-quantity supplied relationship is plotted on the supply curve, which is normally upward sloping, indicating the appetite of suppliers to offer more quantity at higher prices. Possible changes in factors that are not related to the price will shift the supply curve to the right or the left, whereas changes in price will be traced along a fixed supply curve. Jonathan sells coffee at an equilibrium price of $12 per pound. At this price level, he sells approximately 20 million pounds per month. A surge in the quantity supplied of coffee will shift the supply curve to the right. The equilibrium price will fall to $8 per pound and at this price level the quantity demanded will increase to 40 million pounds per month. The lower price will motivate consumers to buy more quantity. So, Jonathan has to provide the quantity demanded to avoid supply shortage. A decline in the quantity supplied of coffee will shift the supply curve to the left. The equilibrium price will rise to $14 per pound and at this price level the quantity demanded will drop to 10 million pounds per month. The higher price will repel consumers from buying more quantity. 1 What Does Supply Curve Mean?